Dr Dan Burisch Press Release "peter7"
"...A primary vector for this disclosure has been taking place on an unmoderated forum at godlikeproductions.com (www.angelfire.com/pe/peter7/project_otus/DanBurischForumLibrary.html) under a thread about Dan Burisch that is now in its fifth volume, with over 10,000 posts [many thousands more, continuing posts into the year 2008.] There are those on the "inside" of the covert operations, who are defecting against their obligations to non-disclosure, posting information to the forum where it is openly analyzed for authenticity and catalogued..."
"...The revealing of his signature will also prove that Burisch is indeed a Ph.D. level microbiologist -- (www.angelfire.com/pe/peter7/project_otus/DanBcredentials.html ) a title that was erased when he was inducted into his present covert operation. That erasure was so complete that one could hardly find evidence that Danny B Catselas Burisch ever lived if it were not for the Internet and private sharing of documents of evidence. The Lotus project involves studies of what is called a "Ganesh particle" which is capable of repairing damages cells. The Ganesh particle itself, which gives off light, has characteristics of being a living intelligence..."
There are even those among the directorate who are helping to leak information from inside the covert operations out into public domain. As of 4/15/04 the Press Release has been linked to and discussed on thecoasttocoastam.com radio talk show and website, which represents the largest late night radio talk show in the USA, that has in excess of 15 million listeners including the world wide web. Also posted and discussed on the Rense.com radio talk show and website, which receives 8 million hits a month. And several dozen other websites & talk shows. Such testimony would presumably disclose an extraterrestrial presence on Earth that has been suppressed from public knowledge for over five decades. Such testimony if it occurred, would formally begin a post-disclosure world where the general public would have to suddenly deal with a myriad number of issues associated with the extraterrestrial presence. � Dan Burisch is no stranger to those working on disclosure of the extraterrestrial presence due to a co-authored book of his titled, Eagles Disobey: The Case for Inca City Mars (1998) that released information on ancient artifacts on Mars to the public. This was the first instance of Burisch coming forth into the public arena with information that is not released through the national security system, and of someone with a conscience that wants to help in promoting disclosure of the extraterrestrial presence. 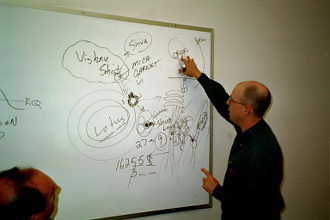 More recently, Burisch is associated with Project Lotus which is based at Area 51, Nevada, and deals with the creation of life, and in particular with something called the 'Ganesh Particle' (http://www.rense.com/general33/searcasdh.htm). � This mysterious particle is supposed to be the key to opening up the most powerful force in creation which is the 'seed of life' itself, and has the ability to heal damaged cells..............As a modern day version of Gilgamesh, Dr Burisch comes across as a very principled and spiritual man who wants to make sure that this esoteric and scientific knowledge is used in a responsible way since it has nothing less than the original creative force behind it, and can be used either for creation or great destruction...". � "...Burisch is opposed by those inside the management system created to deal with extraterrestrials, the Committee of the Majority, who apparently want to manipulate this technology for the typical range of military-industrial uses that national security types are obsessed about in terms of credible 'threat scenarios'. The interesting thing about Burisch is that a number of independent researchers have been able to work with him and even had face to face interviews, etc, thereby leaking all this highly classified information out to the general community. These include researchers such as BJ Wolf, Bill Hamilton, and more recently individuals from the popular Godlike Production forum, Harry Dschaak & Sterling D. Allan. "We have things in the Nevada desert that you and the best�minds in the world won't even be able to conceive that we have for 30 or 40 years, and won't be made�public for another 50." -- Ben Rich, former head engineer to Kelly Johnson at Lockheed's 'Skunk Works'. Peter7, (one of our most quiet contributors) has obviously been very busy these past many months organizing and saving so many pieces of the Dan Burisch Threads for reader friendly catching up and catching on.. Everything you need to know about the first 4 volumes, (and now this one), has been set to light, in a museum type display, including easy links to all the GLP threads, and other helpful Forums . I would gladly recommend Peter7�s link to anyone just arriving, (those who want the two paragraph summary of 10,000 posts), as not just the Library and the Alternate reading room are repeatedly referred to, but main characters and numerous posts from within the threads have been displayed in such a setting to give the newbie insight as to what the all the hype surrounding Dr. Dan Burisch stems from, and why the threads don�t die. After spending most of the night and this morning perusing the angelfire.com site, I am completely refreshed. I realize now why Peter7 chose Alfred Hitchcock the Mystery writer, for an Avatar! The Mystery of Dan Burisch site gives the reader a peek at what critics and debunkers (and the earthly Powers That Be), want you to ignore ---> The Story behind the Mystery [hinted at] by the appearance and persistence of these ongoing discussions. Since Peter7 is obviously not the type to draw attention to himself or to his work, (I�ll take care of that part). PLEASE, everyone, (including Dan�s self appointed courier), do yourself a favor and take a look. Alpha Grey, you ask pertinent questions. 1) The preparations that are being made have to do with compiling the vast amount of corroborative information that will flesh out the statements Dan will be making in his debriefing and beyond. Interviews, documents, images, historical records, physical mementos, physical evidence, affidavits where necessary, etc. This isn't merely a case of Dan rushing to the nearest microphone a la the traditional view of a 'whistleblower'. When he brings the case for Disclosure forward, it will have as much information as could be asked for (short of the corpse or living body of a J-rod). Also, media has to be 'arranged' for, which is even harder than if one simply went to the podium of the White House press briefing room or Rumsfeld's Pentagon podium. Think of what a presidential campaign requires; even though Dan will never run for 'office', the effort required for impinging on the public consciousness is trememdous. 2) Dr Burisch isn't the ONLY one to 'issue Disclosure', he's just the most central. We aren't talking about one of the honorable gov't witnesses lined up with Dr Greer, but someone at the very heart of many of the most secretive and pertinent projects concerned with the extraterrestrial reality. For instance; Sgt. Dan Sherman may have been one of the humans assigned to record the coordinates of each human abduction by the zetans in his 'sector', but Dr Burisch happens to have actually been at the treaty negotiations where these abductions were negotiated. The important issue isn't the person necessarily (in this case it happens to be Dan Burisch) but the knowledge at the root of these issues, and Dan has been at the center of these issues. 3) The Disclosure will be 'vast' in that it will put many things "ET-related" into one context, for the public to understand better. Dan isn't the be-all and end-all of ALL the secrets, or even all of what he's been told about, but he's been the most willing to 'tell the world' and from one of the highest levels of all - as a one-time member of Majestic 12 itself. Your acceptance of this order is hereby requested forthwith."